The Russians are fond of diminutives. To understand it, it is easy to see that Vovotchka – Вовочка, is short for Vova – Вова, which itself is the diminutive of Vladimir. Even if the use of the diminutive is sometimes tricky if one is not Russian, it is the knowledge of these “little things” that will make you a true connoisseur of the language. In Russian, the emotive value of words is increased mostly by extending the word with a suffix. Mom – мама (mama) becomes, for example, mummy – мамочка (mamochka) or мамуля (mamulya). These diminutives express emotions and can apply to everything we want, from a teaspoon – ложечка (lozhechka) or to people, like grandpa – дедуля (dedulya). It is common to be called by affectionate names in families; we saw mum, мамочка (mamochka), who, for example, is having breakfast while daddy – папочка (papotchka) tries to dress their son – сыночек (synochek) and their girl – доченька (dochen’ka)) recounts her last dream to her granny – бабуля (babulya). Attention, though! To shorten ‘brother’ to ‘bro’ is bratok – браток (bratok) and not bratan – братан (bratan), which, in slang, designates a sidekick. In the departure lounge of the airport, if a lady of respectable age who is a fair distance away from her husband and loudly says to him, “my little bunny, we must board”, we will understand that “my little bunny “- зайчонок (zaychonok), comes, in fact, from the word hare – заяц (zayats), not from the word for rabbit – кролик (krolik). Those who think that everybody in Russia is called Sasha or Dima have not yet grasped the countless diminutive versions of Russian names. The friends of the Russian president do not call him Vladimir Vladimirovich but Vova – Вова or Valodia – Володя, or if they are very close, Vovotchka – Вовочка. Ditto for Alexander, who will be called Sacha – Саша, or Shura – Шура, or Sania – Саня. Anyuta – Анюта, and Anya – Аня both refer to a person whose official first name is Anna. Sometimes a name has more than 10 derivatives or diminutives! You will probably find many other “small” first names in Russian during your stay. To find out who is “hiding” behind Lyova- Лева, or Gosha – Гоша, it’s simple. Ask what their full first name is – полное имя (polnoya imya), and take it from there. Sometimes, the diminutive suffix is enough to designate a function. For example, the word table – стол (stol), becomes a restaurant table – столик (stolik), even for ten people. If the word for window is окно (akno), its diminutive окошко (akoshka) denotes a window like the one where you buy metro tickets. The word for cake or pie – пирог (pirog) becomes patty – пирожок (pirazhok) which very well supports the diminutive пирожочек (pirozhochek), without actually decreasing in size. Indeed, an emotional diminutive’s primary function is not one of reducing size. If you are invited to someone’s house for a “small” cup of tea – чашечку чая (chashechku chaya) and a “small” piece of cake – кусочек пирога (kusochek piraga), do not think your host is stingy. Both the cup and the piece of cake will undoubtedly be a good size. Rather, it is the warmth of the invitation to remember, as when imagining drinking a good hot cup of tea with friends while outside, behind the windows, a storm is raging. 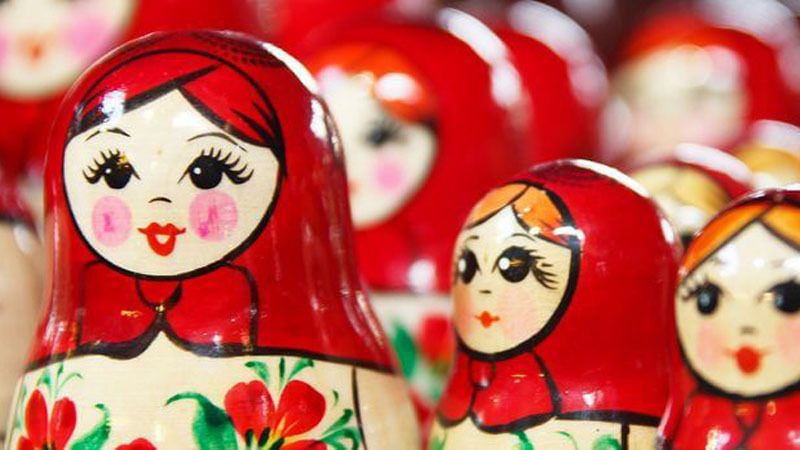 Why is it risky to form diminutives when learning the Russian language? It is because some suffixes can have a negative or derogatory value, like saying “the little people” – народишко (narodishka), which is politically incorrect. Moreover, it is not always easy to assess the degree of intimacy with whom you find yourself with. An inappropriate use can quickly shift the emotive value to unintentional sarcasm or to an unwelcome over-familiarity, and leave a bad taste in your mouth. In any case, if your colleagues or Russian friends address you with a diminutive such as “Allanchik” or “Carolotchka” without irony, it means that you are completely accepted by your team!